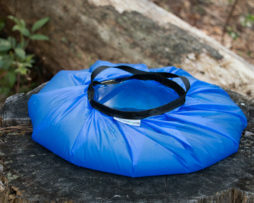 View cart “AntiGravityGear One Gallon Water Bag” has been added to your cart. Save ounces of pack weight! Carrying only what you need is one of the fundamentals of lightweight and ultralight backpacking. The new AntiGravityGear Lightwater Kit now enables you to apply this philosophy to Aquamira drops like never before! Each Lightwater Kit includes 2 – 0.25 oz dropper bottles which hold enough Aquamira to treat approximately 20 L of water, 1 – 0.1 oz dropper bottle for mixing in, a re-sealable plastic carry bag, and instructions for use. How many drops to use: The drops from Lightwater bottles are about half the size of the standard Aquamira drops so use twice the number. For example use 14 of the smaller drops from the Lightwater dropper bottles to equal 7 from the Aquamira bottles. 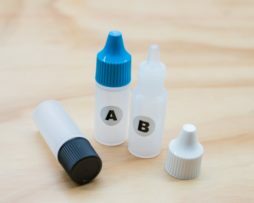 Use the smaller white bottle to mix the drops. 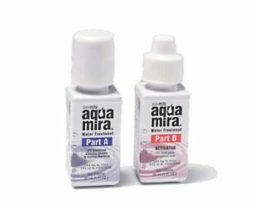 Pre-mixing: The Aquamira company does not recommend pre-mixing quantities for future use because each time you open your pre-mix bottle, the mixture 'gasses off' and loses potency. However, one strategy some hikers use is to only mix a single treatment dose to be used at the next water fill-up. AntiGravityGear does not recommend pre-mixing but if you are going to do this, know that it is against the manufactures recommendations and discard any pre-mix solution that is losing it's color and becoming clear or is more than a few hours old. Always follow the manufacturer's instructions for use. Made to last out of 1.1 oz sil-nylon, this 1 Gallon Water Bag features a light weight carry handle and is the perfect size and weight for solo hikers. Reduce trips to the water source, store extra water for wash-ups and fire safety, etc. 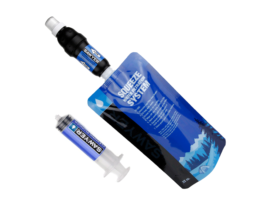 An EPA-registered water treatment designed for wilderness and adventure travelers, campers and outdoor enthusiasts of all kinds. Suitable for treating and improving water from rivers, lakes and streams or straight from the tap. Aquamira is 2% aqueous stabilized chlorine dioxide solution. Chlorine dioxide is used worldwide to treat municipal water, and is known to be an eradicator of bacteria (e-coli, salmonella, legionella) viruses (rolio, rotovirus, hepatitus), and protozoa (giardia and cryptosporidium). Works quickly and efficiently by releasing oxygen in a highly active form to kill odor-causing bacteria without unpleasant taste or odor. 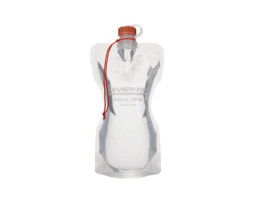 The Evernew 0.9 L Water Carry is a light weight collapsible water bladder that is full of great features and is a great value. Some of the excellent features of this water bladder include a textured screw top closure with keeper strap, 3 layer polyethylene construction with antibacterial treatment, tapered body midsection for easier handling when full, and a gusseted bottom which allows the bladder to stand upright when full. 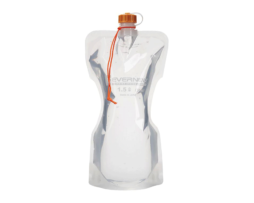 The Evernew 1.5 L Water Carry is a light weight collapsible water bladder that is full of great features and is a great value. 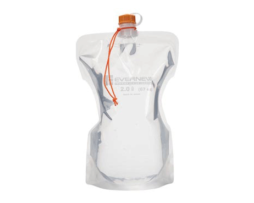 The Evernew 2.0 L Water Carry is a light weight collapsible water bladder that is full of great features and is a great value. The compact Sawyer MicroSqueeze is ideal for outdoor recreation, hiking, camping, scouting, domestic and international travel, and emergency preparedness. This high performance Mini filter fits in the palm of your hand, weighs 2 ounces, and filters up to 100,000 gallons (30 times more than comparable filters). It attaches to the included drinking pouch, standard 28mm threaded disposable water bottles; hydration packs, or use the straw to drink directly from your water source. The dual threaded filter allows for the flip-top drinking cap or flat cap to be used. This kit also includes a cleaning coupling for a compact, lightweight filter cleaning option and also an extra gasket. 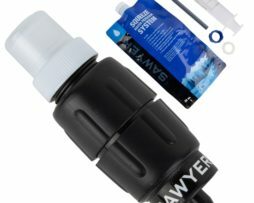 The Sawyer MicroSqueeze Water Filter is a light and versatile personal filtration system and is more compact than the MINI Filter and Squeeze Filter. With a total field weight of 2 ounces it fits in the palm of your hand. This compact filter does the same job that the Sawyer MINI and Squeeze filter does but now in a more compact, versatile filter. Filtering up to 100,000 gallons of water, this may be the last water filter that you buy. The Sawyer MicroSqueeze filter is perfect for everything from camping with the kids to traveling abroad where tap and bottle water cannot be trusted. The filter removes 7 log (99.99999%) of all bacteria (like salmonella) as well as other harmful bacteria which causes cholera, and E. coli, and 6 log (99.9999%) of all protozoa such as giardia and cryptosporidium. These removal rates equal or exceed other filter options. EPA guidelines allow ten times more protozoa left in the water than Sawyer PointONE filters allow. Filtering up to 100,000 gallons of water (30 times more than comparable filters), the Sawyer Mini Water Filtration System may be the last water filter you ever buy. This high performance Mini filter fits in the palm of your hand, weighs 2 ounces, and attaches to the included drinking pouch, standard disposable water bottles; hydration packs (including the Evernew Water Carries), or use the straw to drink directly from your water source. 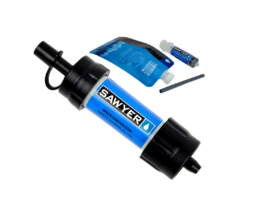 The Sawyer Squeeze Filter is the lightest and most versatile filtration system on the market. With a total field weight of 3 ounces and ability to roll up, it takes up virtually no space in your pack. This product includes one 1L pouch that can be reused hundreds of times. Squeeze the bag and filter water into your water bottle or container of choice. Drink directly from the filter which has a built in push pull cap for on/off functions. Attach the filter onto most threaded water bottles including 2 liter bottles. ©2019 AntiGravityGear, LLC. All Rights Reserved.